So this past week has been somewhat of a disaster for me in the kitchen. A week where I planned and prepped but crashed and burned, literally. I had specific recipes in mind to test and photograph, and not one of them turned out right. I lost my kitchen mojo. I wanted to bake bread and make rosemary potatoes, neither of which worked out. The bread dough didn’t rise properly, and I left the potatoes unattended, which led them to burn to blechness. Then I tried Sarah Britton’s cumin roasted carrots, but I didn’t slice them well enough and they came out all wrinkly and gnarly, hardly appetizing. And then I thought I’d make some strawberry jam, because I’ve done it before and jam is always Christmasy. I went and bought a box of strawberries- and when I was ready to make jam, I opened the fridge to discover my toddler had eaten all but 3. Oh well. Sometimes plans go awry. And the perfect post you plan in your head doesn’t materialize. So I decided to forget the recipes altogether and just go impromptu. Make something that I would like to share with friends, something I’d rustle up for a last-minute dinner. 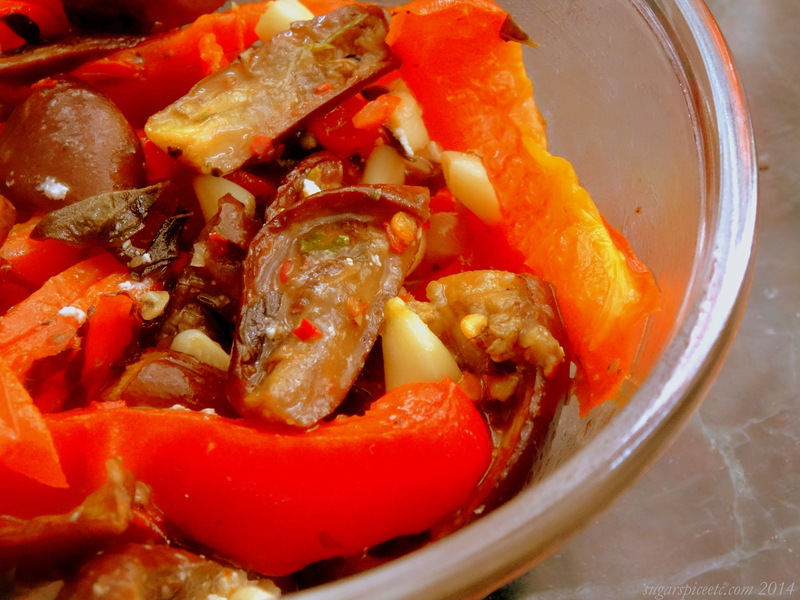 I took inspiration from Nigella Lawson’s baby aubergines recipe from Nigellissima, and from Simon Hopkinson’s Piedmontese peppers recipe. So here I give you an “unrecipe,” something that works for me when I mess up in the kitchen. And I think it would be nice with some crackers and feta for holiday party. 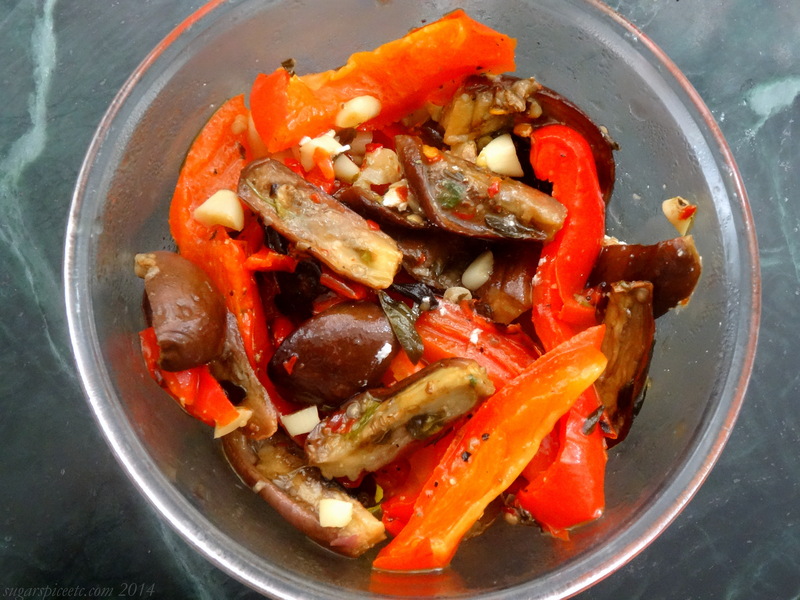 I took a handful of baby eggplants, one large red pepper and sliced them up. (I removed the stalks of the eggplants.) Then I tossed everything with olive oil, sea salt, garlic, red chilli flakes and some dried herbs and poured everything into a baking dish, drizzled more olive oil and baked at 200 C for about 45 mins. A squeeze of lime/lemon over the top once done, and fin. Here’s hoping the week ahead will turn out better. I baked exactly as per your recipe VANILLA ALMOND CAKE and followed your instructions to the ‘T’ and it turned out so purrrfect! The warm milk did wonders and right till the last crumb it remained fresh and yummm. Baking was a very satisfying experience.The use of almond meal gave it a delicious twist…to remember forever!! Looks colourful for sure !